We do not ship internationally. We only ship to the United States and its territories. We highly recommend signing up for USPS Informed Delivery so you can keep track of inbound packages. We offer FREE shipping and typically ship all orders within 24-48 hours of receipt. Please see chart below for expected time to receive your shipment. Alaska, Hawaii, US Territories, Military APO/FPO - Our apologies, but expedited options are not available for these areas. Please allow additional time for these locations. Shipping times may vary due to holidays and weekends. We usually ship orders in 24-48 hours of receipt. We strongly encourage you to select "Signature Confirmation" at checkout for an additional $3 per order to prevent increased package theft. We ship most of our packages via US Postal Service (USPS). While tracking numbers are provided, USPS is inconsistent with scanning their items. Click here to learn more. Please allow extra shipping time during US Postal Service Holidays. We offer 100-day returns, with no restocking fees and pay for shipping both ways. To be eligible for a return, your item must be unopened and in the same condition that you received it in the original packaging. To complete your return, we require a receipt or proof of purchase. Please send us an email to cs@xeteor.com to initiate a return. Once approved, we will provide you with a pre-paid return shipping label. We charge 8.25% sales tax in Nevada. 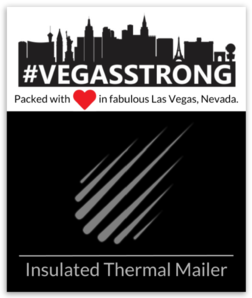 We only ship our test strips in FDA compliant insulated thermal mailers preventing damage due to heat, humidity and improper storage during shipment. From the manufacturer: In a 36-hour thermal test administered by a third party test lab, our insulated thermal materials outperformed the competition. After 24 hours, the contents of our mailers were 10° colder than EPS Foam and 15° colder than other reflective/bubble liners. Learn more about our packaging here. Once your return is received, we'll notify you of receipt of your returned item. We will also notify you on the status of your refund. After approval, a credit will automatically be applied to your credit card or original method of payment within 14 days. If you haven’t received your refund, please check your bank account. If the refund has not posted, then contact your credit card company. There is often a processing time before a refund is posted, so it may take some time before your refund is officially posted. If you’ve done all of this and still have not received your refund yet, please contact us at cs@xeteor.com. We only replace items that are defective or damaged. If you need to exchange it for the same item, send us an email at cs@xeteor.com.